I will be on vacation. So, any recommendations on places to go? Places to see? Places to eat? 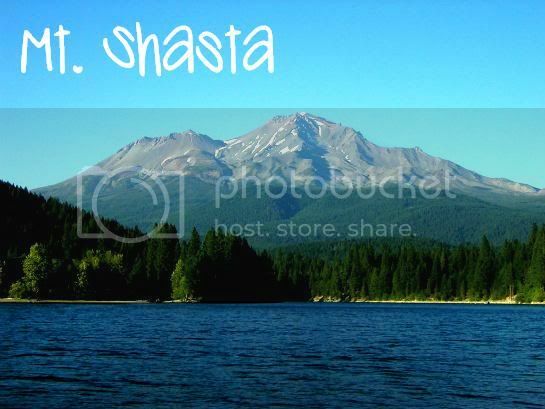 I actually used to live in Northern California. I've seen a lot of these places, but to be honest, I kind of took it for granted. I lived in California from the summer of 2000 (freshman year of high school) to the summer of 2004. I visited often until 2006. It has been 5 years since I've been back. Wholy crap, that is a long time. 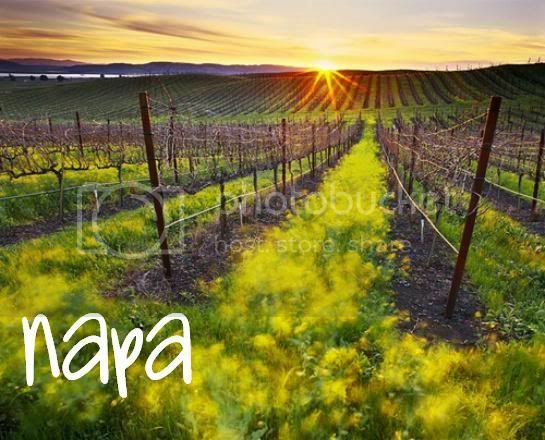 Since I was in high school when I lived there, I didn't get to experience Napa Wineries. I drove by them all the time, and pretty much was surrounded by all this awesomeness...but I was busy with sports and school ALL. THE. TIME. ONE WEEK BABY! Whoop! Whoop! ugh SOO LUCKY!!! I cant wait to go on vacation! Get drunk at a Napa winery!! YUMMY WINE! Also, on Jon an Kate plus 8, they went to the redwood forest and got gigantic pinecones. mail me one! how awesome! I loooove California. I'm leaving to San Francisco tomorrow!!!! So if I find anything super awesome to do, I will let you know. 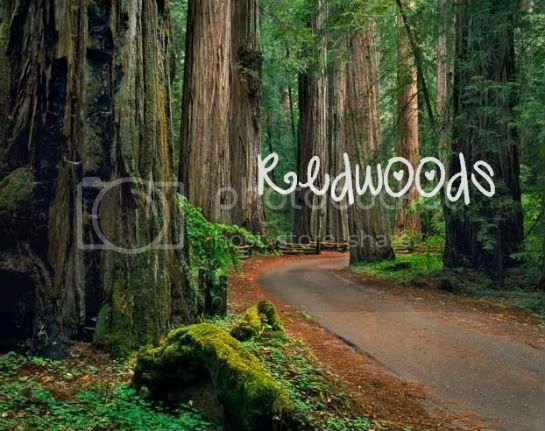 We used to do the whole Redwoods things when I was younger (we have family in Northern Cal) and they are some of my most favorite memories!! I'm with "Young and Fabulous!" I'm sooo jealous of you because I am in major need of a vacation! Also, I have never been there so I have no where I can tell you to go. :( But yes, drink lots of wine and I'm sure you'll have fun wherever you are! omg yall are going to have so much fun! i can't wait to see all the pictures! i'm sure you'll take plenty, right. 1) Ike's place - it's a little out of the way, but the sandwiches are so worth it! Your husband will thank you. 2) The bistro at the Cliff House. So, worth the money! 1) San Francisco Art Institute. It's free to go in and honestly has the best views in the city! 2) Bike across the bridge into the town of Sausalito. Gorgeous little town and so worth the bike! k i guess its not mine. you are gonna have a BLAST. I LOVE nor cal..so bummed i wasnt able to go this trip. have a blast! 2nd - Napa Moet Chandon & Robert Mondavi wineries! 3rd - SF Giants Game! How fun!! :D I've only been to northern California once when I was a sophomore in high school. I remember liking pier 49, but you've probably been there already. Haha! I agree with Jenn @ West Sac Honey! Meet us up and get lunch or coffee! I use to live in Sonoma, and since turning 21, I still haven't gone wine tasting there! There are tons of good wineries though. Domaine Carneros in Napa, a lot of them in Sonoma Valley, and Kenwood is a great place to go because they have like 10 wineries within 5 miles of each other. If you go to San Fran, go to Ghiradelli Square near Pier 39. And the science museum in Golden Gate Park. I went camping in the redwoods a few weeks ago, and if you go camping, take a bike with you! It's a nice and relaxing thing to do there. Sounds like it will be LOTS of fun! Okay, I cannot believe your hubby has never been to Cali, I am so sad for him! Your gonna have so much fun I am excited for you! How fun! Redwoods and San Fransisco are amazing! Definitely wine taste at Artesia -- they have the BEST view of the valley and if the weather is clear, you can see the ocean. It's extremely unique to Napa and is the most memorable winery I've ever been to! If you guys like to picnic -- head off to a market and ut some wine, cheese, etc and picnic over at Bartholomew Park Winery in Sonoma. It's secluded and romantic. We got engaged on a picnic there :) You'd love it!! I used to live in SF! I recc' going to Sudachi on Sutter Street-AMAZING SUSHI! (and cheap!!) The Cheesecake Factory in Macy's in Union Square has a gorgeous view. I also enjoy going down to the Haight and shopping at the thrift stores. OH! And Baker Beach. 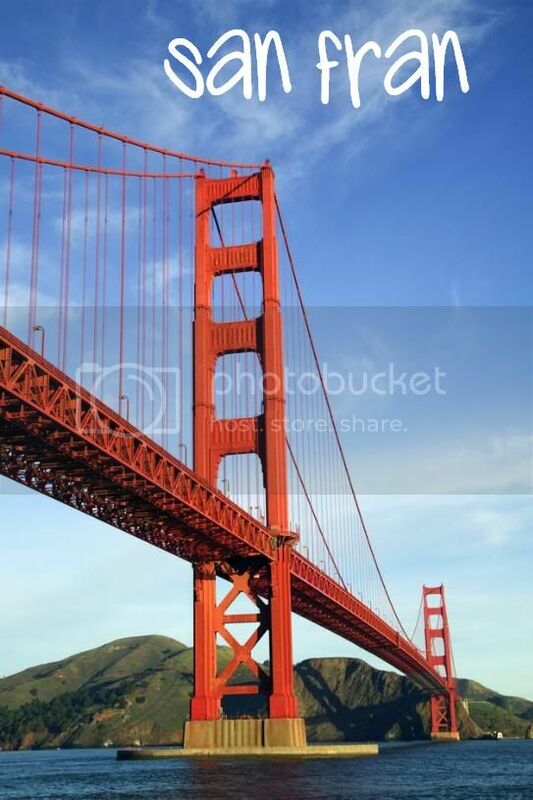 That has a great view of the Golden Gate!! Pack warm! My husband and I went to SF in August a couple of years ago and it was soooo cold! I swear I'm wearing the same sweater in every picture because I only brought one in the thought that it was California! We loved our 2 nights in Sausalito - stayed at a lovely guest house and ate in small, local and delicious restaurants!